I can not write if I am out of humour. With opportunity the world is very interesting. Let us collect our property - and other people's - and depart at once. There are seasons when things go wrong; and they just have to be lived through. WHAT a funny sight it is to see a brood of ducklings with a hen! I hold an old-fashioned notion that a happy marriage is the crown of a woman’s life. There's nothing like open air for soothing present anxiety and memories of past sadness. One place suits one person, another place suits another person. 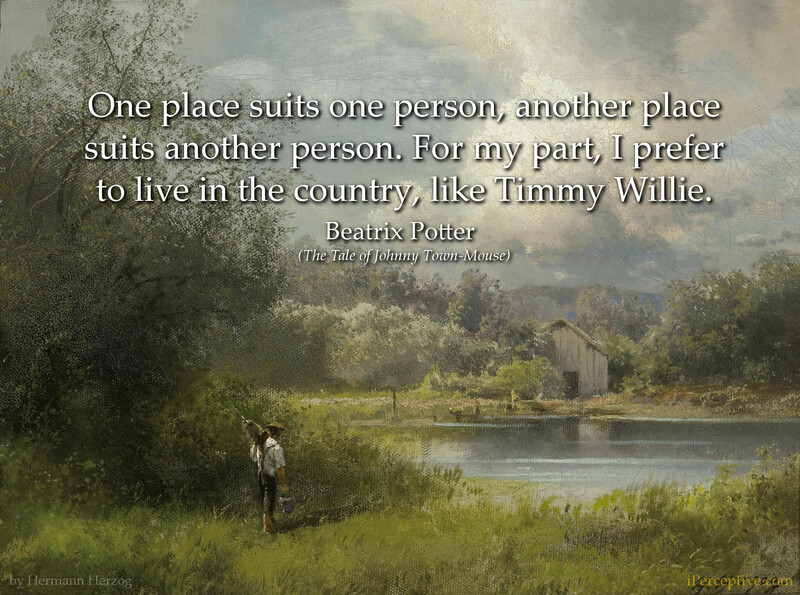 For my part, I prefer to live in the country, like Timmy Willie. We find some people make theories out of dried specimens without the least experience of the way things grow. If I have done anything, even a little, to help small children enjoy honest, simple pleasures, I have done a bit of good. Once upon a time there were four little Rabbits, and their names were--Flopsy, Mopsy, Cottontail, and Peter. Most people, after one success, are so cringingly afraid of doing less well that they rub all the edge off their subsequent work. For quiet, solitary and observant children create their own world and live in it, nourishing their imaginations on the material at hand. What we call the highest and the lowest in nature are both equally perfect. A willow bush is as beautiful as the human form divine. 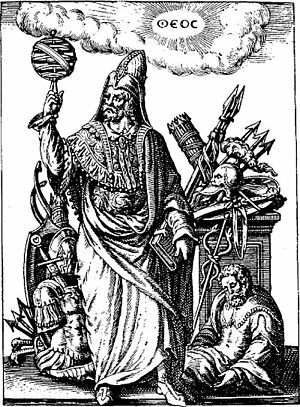 All outward forms of religion are almost useless, and are the causes of endless strife... Believe there is a great power silently working all things for good, behave yourself and never mind the rest. Once upon a time there were three kittens, and their names were Mitten, Tom Kitten, and Moppet. They had dear little fur coats of their own; and they tumbled about the doorstep and played in the dust. I remember I used to half believe and wholly play with fairies when I was a child. What heaven can be more real than to retain the spirit-world of childhood, tempered and balanced by knowledge and common-sense. For behind the wooden wainscots of all the old houses in Gloucester, there are little mouse staircases and secret trap-doors; and the mice run from house to house through those long narrow passages; they can run all over the town without going into the streets. In Summer there were white and damask roses, and the smell of thyme and musk. In Spring there were green gooseberries and throstles [thrush], and the flowers they call ceninen [daffodils]. And leeks and cabbages also grew in that garden; and between long straight alleys, and apple-trained espaliers, there were beds of strawberries, and mint, and sage. 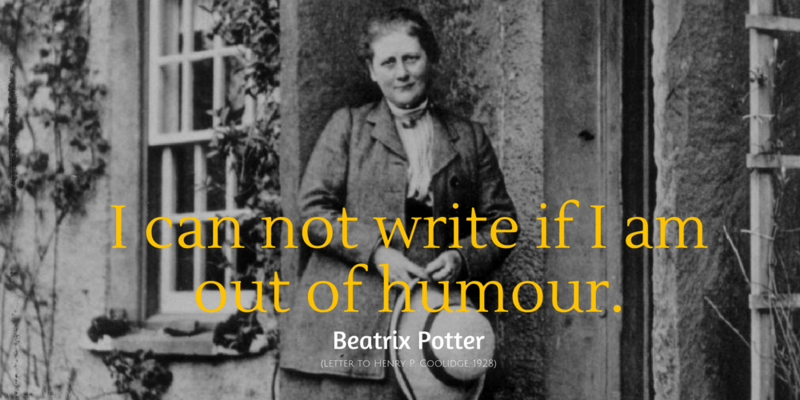 Beatrix Potter was a English writer, scientist and illustrator that is best known for her children's stories featuring animals. Her most notable work is The Tale of Peter Rabbit.